Sweden’s famed ICEHOTEL, perhaps the “coolest” hotel in the world, has just unveiled a permanent luxury lodge made entirely of ice. The newly-designed ICEHOTEL 365 has all of the chilly charm of its sister hotel, but will be open 365 days a year thanks to state-of-the-art solar-powered cooling technology that will keep the structure frozen during summer months. Located 200 km north of the Arctic Circle in the Swedish village of Jukkasjarvi, ICEHOTEL rose to fame thanks to its unique igloo structure made out of “snice”, a mixture of snow and ice collected from the Torne River. The fantastical structure has been built and rebuilt every year since 1989. Now the new ICEHOTEL 365, which sits adjacent to the other temporary structure, has just been unveiled. Thanks to the solar-powered cooling technology, guests can now enjoy either cold or warm rooms year round, along with a cocktail room, saunas, and even an ice church. The cold rooms are kept between -5 and -8 degrees Celsius, and although the beds are made from blocks of ice, they have thick mattresses on top of wood crates for added comfort. Reindeer hides and thermal sleeping bags keep guests warm and comfy during the night. Like the original hotel, the 365 version has a series of thematic rooms called Art Suites. Each room has carved ice detailing created by artists from around the world. And if you really want to splurge, go for the Deluxe Suites. The largest suites in the hotel, the Deluxe Suites also have individually designed carvings as well as a private heated relaxation area, sauna, shower, and en suite bathrooms. Sweden's famed ICEHOTEL, perhaps the "coolest" hotel in the world, has just unveiled a permanent luxury lodge, still completely made of ice. The newly-designed ICEHOTEL 365 has all of the chilly charm of its sister hotel, but will be open 365 days a year thanks to state-of-the-art solar powered cooling technology that will cool the ice structure during the summer months. 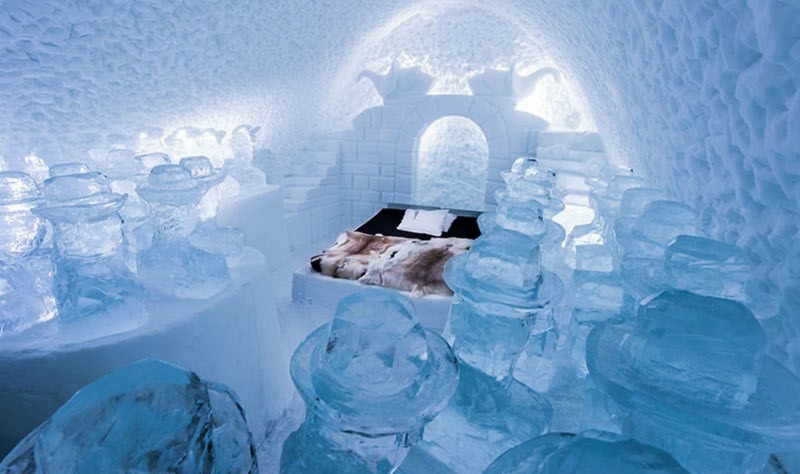 Located a mere 200 km north of the Arctic Circle, in the Swedish village of Jukkasjarvi, the original ICEHOTEL rose to fame thanks to its unique igloo structure made out of "snice", a mixture of snow and ice collected from the Torne River. The fantastical structure has been built and rebuilt every year since 1989. Now, the new ICEHOTEL 365, which sits adjacent to the other temporary structure, has just been unveiled. Thanks to the solar powered cooling technology, guests can now enjoy both cold and warm rooms year round. The hotel still offers a variety of amenities such as a cocktail room and saunas. 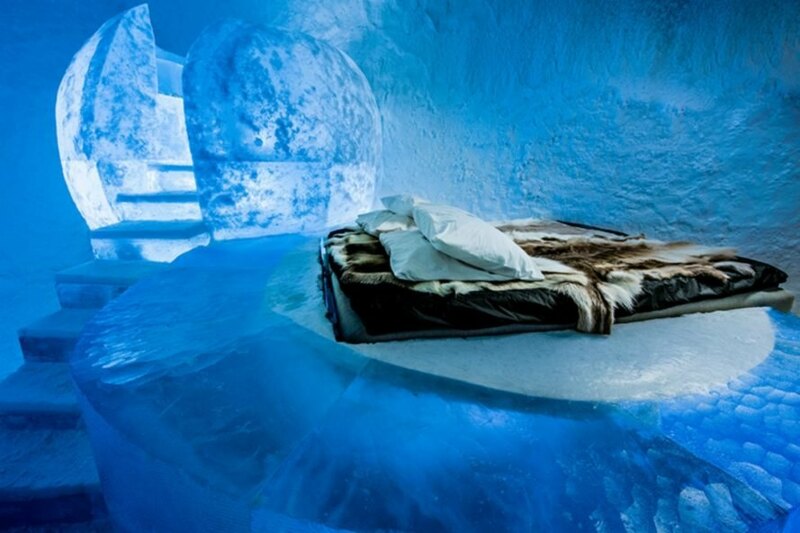 And for those love birds out there, the hotel even has an ice church to host the perfect arctic wedding. ICEHOTEL 365 has both cold and warm rooms and guests can enjoy the cocktail room, saunas and even an ice church. The cold rooms are each kept between -5 and -8 degrees Celsius. 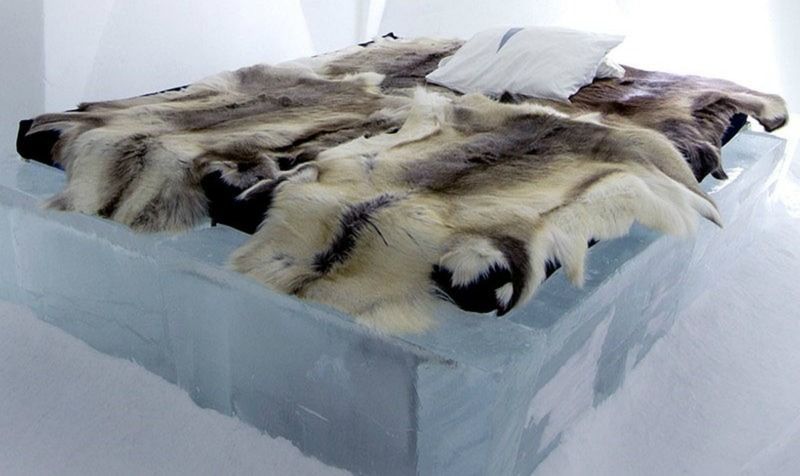 Although the beds are made from blocks of ice, they have thick mattresses on top of wood crates for added comfort. Reindeer hides and thermal sleeping bags keep guests warm and comfy during the night. Like the original hotel, the 365 version has a series of thematic rooms, the Art Suites, which have carved ice detailing creating by artists from around the world. And if you really want to splurge, go for the Deluxe Suites. The largest suites in the hotel, the Deluxe Suites also have individually designed carvings as well as a private heated relaxation area, a sauna, shower, and en suite bathroom. Like the original hotel, the 365 version has a series of thematic rooms, the Art Suites, which have carved ice detailing creating by artists from around the world.